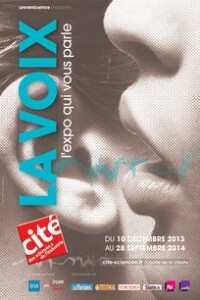 “La voix, l’expo qui vous parle” is a set of three installations taking part on a large-public exhibition about the voice, taking place at la cité des sciences, Paris. The first installation has been designed to let people play with French well-known voices, such as the voices of Jane Birkin or David Pujadas. Audience can transform these voices with two potentiometers: One of the controller changes the age of the voice (from young people to age ones), whereas the other changes the gender of it (from man to woman). The second installation looks like the previous one, but allows for changing gender and age of his own voice. The user can record its own voice and play it while manipulating it in the same way (s)he does it with well-known voices. The third installation proposes to the user to sing in a small room. A real-time choir harmonizer accompanies the singer, who has the choice to change the mode of the accompaniment (minor/major) and the acoustics of the room (from church to bathroom reverberations).